This entry was posted in Capitalism on October 29, 2011 by apciv. This entry was posted in Empire, The Americas on October 28, 2011 by apciv. This entry was posted in Capitalism on October 27, 2011 by apciv. The non-partisan Congressional Budget Office just released a new study. Here’s one of the graphs from the summary. Market income is defined as “labor income (such as cash wages and salaries and employer-paid health insurance premiums), business income, capital gains, capital income, and other income” before taxes. 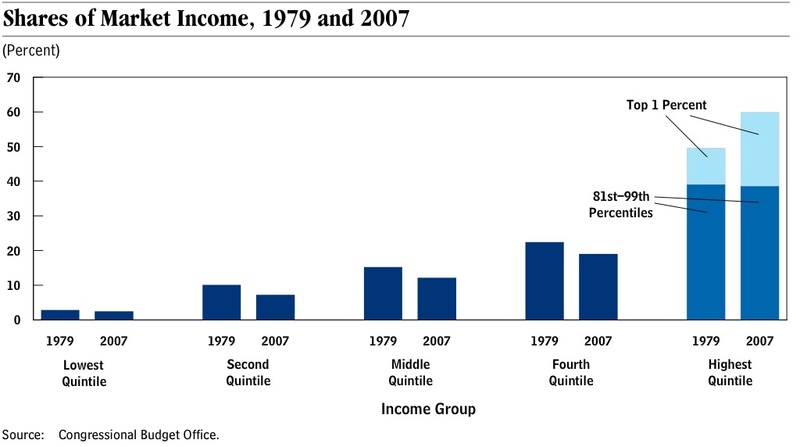 The top 1% almost tripled its income between 1979 and 2001. This entry was posted in Capitalism on October 26, 2011 by apciv. Thanks to Eric for passing this along. The trailer combines game-reality with live action, producing an effect that people such as Umberto Eco have called “hyperreality.” In a sense, real life isn’t real enough. This entry was posted in Contemporary Culture, Pop culture on October 26, 2011 by apciv. The comment piece below from Zizek complements Mark Fisher’s Capitalist Realism. Note that he argues that the absence of a particular set of demands which the Permissive Father may register, trivialize, and dismiss represents a strength of OWS . The Right attacks OWS incoherently as dirty hippies or Stalinist wannabes while the Democratic Party– the “Left” of the truncated US political spectrum– seeks to channel their energies into enthusiasm for “new” policies (Obama’s tepid jobs program, more public $ for private financial companies, etc.). MTV is promoting a “special episode”/ reality show titled True Life: I’m Occupying Wall Street. Contrary to rumors, Christopher Nolan will not be using Zucotti Park as a backdrop for some scenes of Dark Knight Rises. This entry was posted in Capitalism, Music on October 25, 2011 by apciv.